Catanduanes is an island province located in the Bicol Region of Luzon in the Philippines. It is the 12th-largest Island in the Philippines. Its capital is Virac and the province lies to the east of Camarines Sur across Maqueda Channel. It had a population of 260,964 people as registered in the 2015 census. Isla de Cobos was Catanduanes' first name, given by Spanish conquistadores during the early part of 1573 when came upon several tribes living in the thatched huts called cobos. Catanduanes, is a hispanized term derived from the word tandu, a native beetle and the samdong tree, which were both found in abundance throughout the island. Common reference to katanduan or kasamdongan, meaning a place where the tandu or the samdong tree thrives in abundance, led to the coining of the word Catanduanes. Bornean datus settled on the island of Panay. Their descendants then migrated throughout the archipelago and became the first settlers in Catanduanes. The island was not spared from raids of the Moros coming from the island of Mindanao. Because of these destructive raids, many records of the past were destroyed and lost. 1573 when Juan de Salcedo arrived in Catanduanes hunting for pirates, and conquered the natives. Three years later, a galleon expedition from Acapulco was shipwrecked near the island and the survivors were either killed or made servants. The Batalay Church in Bato, just several kilometers from the capital town of Virac, marks that historical event. The evangelization of the island started twenty years later when the soldiers of Spain, after subjugating the Bicol mainland, came back with Franciscan missionaries. The missionaries armed with the cross and backed by the sword of the conquistadors evangelized the entire population without much resistance, after initially converting the southern tribes. From 1600 to 1857, the colonizers were able to put up nine centers of local governments through the establishment of parishes: Caramoran (1601); Pandan (1650); Viga (1661); Panganiban (1663); Virac (1775); Bato (1830); and San Andres (1853). During the early 1950s, Baras was created. 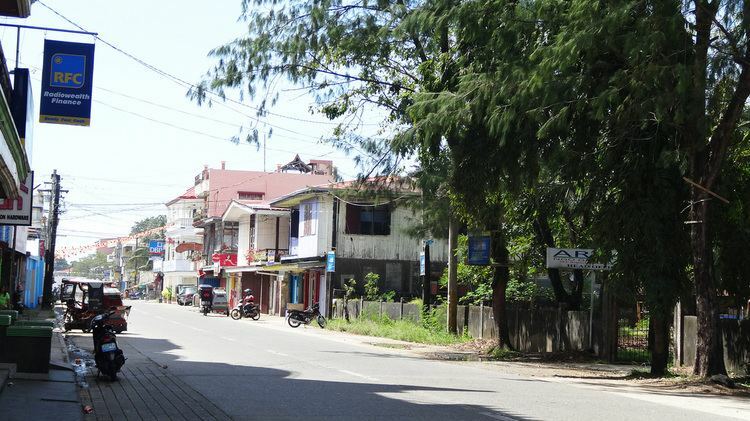 Bagamanoc, a thriving municipality during the Spanish period was reduced to a mere barrio of Viga and later of Panganiban, during the American regime. It formally became a municipality in 1950 followed by Gigmoto in 1951, and San Miguel in 1952. It was during this period that the island saw its own development growth. Interlinking roads built and trading centers created. During the American Regime, some locals refused to recognize the sovereignty of the United States, and most of them fled to the mountains. The American occupation did not last long. In 1934, the Americans had ceased control of the island. During World War II, Catanduanes was not spared from Japanese invasion. The Japanese erected garrisons in different parts of the island and heavily fortified it. Three months after the Philippine independence from the Americans, Catanduanes was finally recognized as a separate and independent province from Albay through Commonwealth Act No. 687 authored by then Representative Francisco Perfecto. The independence was approved by Congress on September 26, 1945, signed into law by President Sergio Osmena, Sr. on October 24, 1945, and took effect on October 26, 1945. Catanduanes became the sixth province of the Bicol Region with the signing of the Act. Remigio Socito, the last Lieutenant Governor of Catanduanes was appointed as the first Provincial Governor. When elections were held in 1947, Alfonso V. Usero became the first elected Governor. On September 26, 1945, Catanduanes after recognized as a separate and independent province, under Republic Act No. 159, dated June 26, 1947 the former municipality of Caramoan was recreated out of the Municipality of Pandan; under R.A. No. 491, dated June 12, 1950, the Municipality of Bagamanoc was also created. Catanduanes is situated in the easternmost fringe of Luzon: 13.3 to 14.1 degrees north latitudes and between 124.1 and 124.3 degrees east longitudes. The island bounded on the west by the Maqueda Channel, on the south by Lagonoy Gulf, and on the north and east by the Philippine Sea. Several small islands comprise the province. Its aggregate land area totals approximately 1,492.16 square kilometres (576.13 sq mi). The coastlines, that stretch to almost 400 km (249 mi), are jagged with many bays. The topography of Catanduanes Island is rugged and mountainous, becoming more pronounced towards the central portion of the island. Less than 10 percent of the land area has a slope gradient under 8 percent, mostly fractured and narrow strips of plains located along the coastal areas where most of the inhabitants are settled. The highest mountain peak is in Boctot, located between the municipalities of Virac and San Miguel with an elevation of 803 metres (2,635 ft) above sea level. It is the premier mountain range with broadly spread old-growth forests and watershed which exerts widespread influence over its immediate environs that include the municipalities of Virac, Bato, and San Miguel. Other prominent mountain forms include the ranges: Obi in Caramoran, Cagmasoso in San Andres, and the Summit and Magsumoso ranges within the Viga and Gigmoto areas. The lowlands include the Virac Plain, Viga Plain, San Andres Plain and the Bato River Flood Plain. The coastal municipalities with limited lowland agricultural areas are Pandan and Caramoran. The more extensive lowlands are found in the southern parts of the province. The largest coastal plain is the contiguous wetlands of Viga, Panganiban and Bagamanoc over which lies the widest area of rice paddies and nipa mangroves. The province is mostly rugged and mountainous terrain. Its slope characteristics are 13% gently sloping to undulating, 1% classified rolling to hilly, 2% very hills and mountains, 47% level to very gently sloping, 32% steep hills and mountainous, and 5% undulating to rolling. Ten of the eleven municipalities of the province are situated along the coastal fringes, over which locate its mostly fractured plains. The only landlocked municipality is San Miguel with its poblacion (town center) sitting in a location entirely devoid of flat lands. The majority of the built-up areas occupy zones that are classified as flat to rolling. Without a pronounced dry season, precipitation is distributed fairly well throughout the year becoming wetter in the last quarter into the early months of the first quarter, when tropical disturbances and monsoon winds especially the Northeast Monsoon (Amihan) bring in heavy rains. Other months are characterized by short periods of dryer days and fine weather, except in July and August when the dry and gusty northwest monsoon winds intensify. Catanduanes' geographical position has it lying completely exposed to the Philippine Sea. Therefore, it is known as "Land of the Howling Winds" because it is frequently visited by tropical storms. Catanduanes comprises 11 municipalities, all encompassed by a single legislative district. The population of Catanduanes in the 2015 census was 260,964 people, with a density of 170 inhabitants per square kilometre or 440 inhabitants per square mile. In May 2000, its total population was 215,356 with an annual growth rate of 1.42% from 1990 to 2000, and a population density of 142 per km2. Over the following 10 years, the average annual growth rate was 1.35%, increasing the population to 246,300 persons in the May 2010 census. Almost all of the people of the province are natural born citizens. Naturalized citizens, most of which are Chinese, comprised only about one percent of the population. The number of households totaled 41,019 with an average household size of 5.25. Roman Catholicism is the religion of the vast majority, comprising 97% of Catanduanes' population. The remaining faith of the inhabitants is divided into the various Religious, Evangelical, Protestant groups such as Aglipayan Church, Baptists, Methodists, other Evangelical Christians, Mormons, Jehovah's Witnesses, Iglesia ni Cristo, Seventh-day Adventist as well as Moslems. There are two variants of the Bikol languages native to this island province: Northern Catanduanes Bicolano and Southern Catanduanes Bicolano. The northern accent has a very pronounced letter "R" that becomes a diphthong of non-vowel letters "L" and "R" in the southern towns. In written form, the conventional mainland language like Central Bikol is used. Filipino, by virtue of being officially taught in schools and the affinity of most Bicolanos to it, is the second most common language and easily the most understood by most people. English is the normal medium used in primary communications. The use of the Spanish as a local language seems to have vanished after the turn of the early 21st century and so on. When the Spaniards came to the Philippines, Catanduanes, being on the Pacific Ocean side and on the very route of the galleon ships, was one of the first places they penetrated to propagate Christianity. The Spanish priests founded churches in every town. People from mainland Bicol also traveled to Catanduanes, specifically Caramoran which is directly across from Albay. The research of McFarland on the year 1974, the dialects of Bicol area, stated that until the advent of the twentieth century and the development brought about by modernization, Northern Catanduanes was quite isolated from mainland Bicol and Southern Catanduanes, resulting in less opportunity for contact between different groups. One probable reason why the Northern Catanduanes language variety is distinct from the Southern Catanduanes variety is that the mountainous terrain separating the north from the south acts as a barrier to community interaction. The lack of good roads and transportation arising from the terrain contributed to the present situation. Since the seaport is in Virac, Northern Catanduanes remained in isolation from other subgroups for quite some time. Furthermore, the inhabitants of Northern Catanduanes were the first occupants of the island to have been pushed northwards when immigrants from the mainland occupied the southern part of the island. This supports the closeness of the Southern Catanduanes variety to other Bicol subgroups while the Northern Catanduanes has more distinct features. The predominant ethnic group is the Bicolano people. Migrants from other parts of Luzon, as well as Visayas and Mindanao, make up a minority as well. Few, who are of Chinese, Australian, American, and Spanish descent also live in the province. Catanduanes was historically a part of the Albay province. On October 26, 1945, it was separated from Albay and was declared an island-province throughf Commonwealth Act No. 687. When the island was still in transition to becoming a full-pledge province, it was headed by Lt. Governor Felipe Olesco Usero. Gubernatorial elections for Catanduanes started in 1948. The People Power Revolution in February 1986 ushered in new leadership. Former Ambassador Leandro I. Verceles Sr. was appointed Governor of the province. In 1988, Governor Leandro I. Verceles Sr. ran for Governor and won the election. His term ended in 1992 when lost to Governor Rosalie A. Estacio. After Governor Estacio, Governor Severo C. Alcantara became the governor of the province in 1995. Gov. Alcantara did not run for re-election due to failing health. In 1998 Governor Hector S. Sanchez won the election. Governor Sanchez ran for re-election but lost to Governor Leandro B. Verceles Jr who became governor for two successive terms. In 2007 synchronized elections, Gov. Verceles run again for his third and last term for governor but lost to Governor Joseph C. Cua, who became governor from 2007 to 2013 for two successive terms but lost to Gov. Araceli B. Wong last May 2013 election. In the May 2016 election Gov. Cely Wong son Jardin Brian Wong lost to then Governor Joseph Cua as governor of the province. The lone Legislative District of Catanduanes is the representation of the Province of Catanduanes in the Philippine House of Representatives. Catanduanes was represented as part of Albay's second district from 1907 to 1931, and fully comprised that province's fourth district from 1931 to 1946. It started electing its own representative in 1946, after becoming a full-fledged province in 1945. From 1978 to 1984 it was part of the representation of Region V.
The Island is the most progressive province in the Bicol Region in HDI ranking although it placed just a little −0.3 in the HDI National Average. The 2009 report of HDN (Human Development Network) which is a branch of the United Nations HDI (Human Development Index) listed the province is ranked 1st in the region or rank 20th at 0.630 HDI value (excluding Metro Manila) among Philippine Provinces HDI's. For reference, the province of Albay ranked 2nd in the region or ranked 41st among Philippine Provinces HDI's (excluding Metro Manila) at 0.518 HDI value. Agriculture, fishing, and tourism are some of the other main sources of employment on the island. Several handicrafts such as jewelry manufacturing and other small-scale industries also contribute to the province's economy. The province is rich in natural resources such as forests, waterfalls, rivers, mineral deposits and productive soil made fertile by volcanic ashes of distant Mayon Volcano. Rattancraft, fishing, buri hat and mat making, and abaca fiber craft are among the important industries of the island. Virac, the capital town of the island was among the top in terms of infrastructure in 2012 Most Competitive Municipality category according to the National Competitiveness Council (NCC). The five major income sources of Catanduanes are the services, agriculture, and fishing, tourism, housing, and manufacturing industries. From 2001 through 2010, the Philippines production of abaca fiber (Manila hemp) averaged 65,701 mt per year and was decreasing at a rate of at least 0.8% per annum. The decrease was caused by the devastating typhoons in 2006, abaca viral diseases that continued to affect the plantations, and the dampened foreign demand brought about by the global economic recession beginning in the latter part of 2008, the most severe downturn since the Great Depression in the 1930s. Production reached its peak in 2008 at 77,387 mt as outputs of all producing regions, particularly Bicol, Davao Region and Caraga, substantially increased during the period. This was primarily the effect of the incremental production from the abaca plantations established in 2005 and 2006 under FIDA's program Goal I "Development of New Agri-Business Lands" and the continued strong demand and attractive prices offered for the fiber by local traders, processors/manufacturers, and exporters. The abaca industry, however, suffered a setback in 2009 when fiber yield slumped to its lowest level of 54,584 mt due to the weakened market demand and falling prices as a consequence of the worldwide financial crisis. Catanduanes Island is the native habitat of the endemic abaca plant (a banana relative) which is globally renowned for its strong fiber. In fact, the Philippines FIDA (Fiber Industry Development Authority) declared the island as the highest abaca-producing province in 2010. In 2009–2013, The Philippine Rural Development Program (PRDP) and the Department of Agriculture, Bicol Region had 39% share of Philippine Abaca production, emerged as the biggest produce while overwhelming 92% comes from Catanduanes the biggest abaca-producing province in the country. The home of the finest grade of abaca fiber. Lately, the indigenous abaca fiber, commonly called "pinukpok," produced and woven by the locals of Baras, Catanduanes, has now found its niche in the local and international fashion industry. This indigenous fabric has shown its versatility in the globally appealing designs and creations of famous fashion designer Dita Sandico-Ong. Until now wild type of abaca can still be found in the interior forests of the province which is often not cultivated. Despite having been ravaged by three super typhoons in the last two decades, Catanduanes has maintained its "abaca country" status as the top abaca fiber-producing province in the Philippines. In 2015 alone, the island's 12,789 abaca farmers produced 23,550 metric tons of raw fiber, comprising 40 percent of the total abaca fiber production nationwide. The local fiber harvest is even higher than the production of Ecuador, the second-biggest abaca producer in the world after the Philippines. Catanduanes mud crab industry is being supported by the Bureau of Fisheries and Aquatic Resources, Department of Science and Technology, Department of Environment and Natural Resources, Department of Labor and Employment and Catanduanes State University. The provincial government is maintaining the Catanduanes Crab Center (CCC) which serves as a source of crablets for grow-out and fattening by fishpond operators. It carries out a special program for "queen" or "gravid" crabs designed to ensure the sustainability of the industry in the province, which originally owned the "crab capital of the Philippines" title. The province's mud crab industry is focusing on the production of female crabs that play an important role in marketing, particularly in Asian countries such as Japan, Taiwan, Hong Kong and Singapore. The tourism industry in the province is growing relatively quickly despite the fact that the island experiences almost year-round typhoons, labeling the province as a "Typhoon Capital of the Philippines" with the tagline "The Land of the Howling Winds". 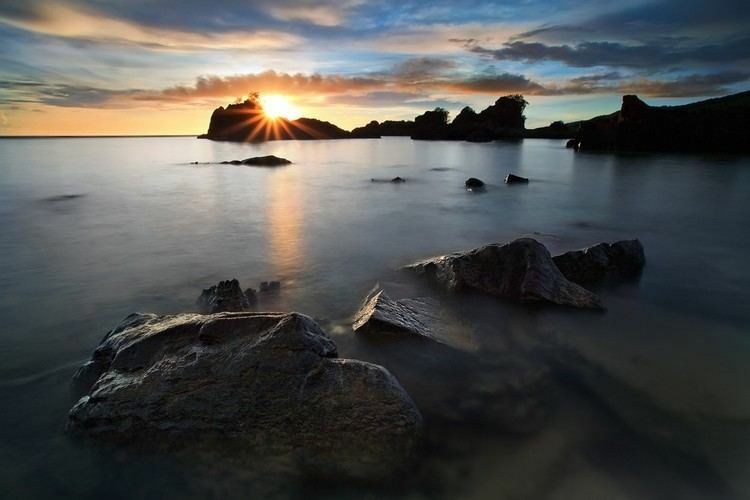 Catanduanes is known for its beaches, prehistoric caves, quaint stone chapels and massive churches. Despite the typhoons, safe anchorage is provided by its many bays and coves notably Kalapalan, Gigmoto, Soboc, and Cabugao. Its Pacific coastline attracts surfers, particularly at Baras. The province features beaches with fine sand and coral formations and several caves which include the Luyang Cave. The PAGASA Weather Radar Station offers panoramic views of the environs, while the Museo de Catanduanes has a fine collection of artifacts. 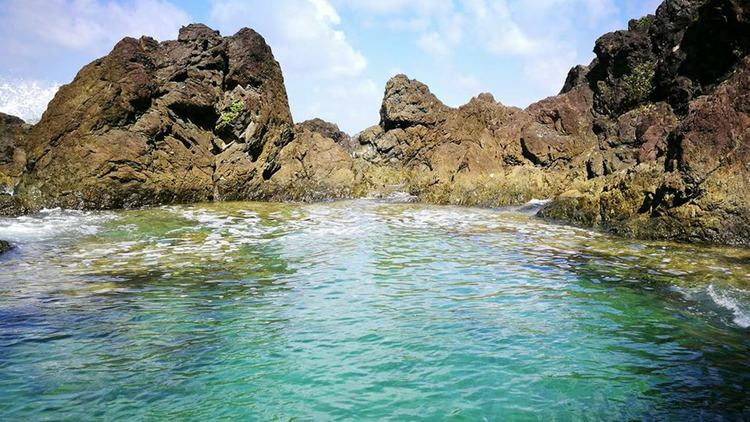 The ideal time of the year to visit Catanduanes is from the months of March to August when the weather turns dry. It is coolest and rainiest from October to the early part of January, hottest from March to May. The tourism industry in Catanduanes continues to receive a positive response from foreign and domestic travelers, with the Provincial Tourism Office recording an increase in tourist arrivals by 15.89% in 2014 compared to the previous year. Based on the comparative data of travelers, 151,550 foreign and domestic tourists visited the island last year, or about 21,000 greater than the 2013 arrivals of only 130,766 visitors. Saint John the Baptist Catholic Church – located in Poblacion, Bato near the Bato River. It is the only remaining structure of its kind in the entire island. The church is of interest not only as a mid-colonization Filipino-Spanish architecture but as a historical landmark. It was built under the polo system of forced labor for a total of 53 years under six different parish administrators. Started in 1830 and finished in 1883, Bato Church has withstood wars, calamities, and ravages of time. Holy Cross of Batalay Shrine – located in Batalay, Bato. It is the site where the first Catholic Cross was planted in Catanduanes and was built over the burial place of Augustinian priest Fray Diego de Herrera in 1576 who died in Batalay, Bato. Legend says that a spring water sprouted near the cross believed to have healing powers. It is a common belief that the cross presently enshrined in the Batalay Chapel is still the original cross planted more than 420 years ago. Batalay has been the center of annual religious pilgrimages from people of different places. The Holy Cross of Batalay is a Diocesan shrine with the right to hold a liturgical celebration on the last Friday of April every year. Our Lady of Sorrows Shrine – located in Batong Paloway, San Andres. The thumbnail-sized river stone bearing the mystical face of the Virgin Mary found on a river bank is believed to have grown in size over the years. At present, one can view the image with the bare eyes unlike before, when one had to use a magnifying lens. The image has drawn many devotees throughout the years and mass is heard every Friday afternoon as devotees flock the chapel regularly to pray the rosary and novenas. Every Lenten week celebration, people on Holy Thursday walk from Virac and as far as Batalay, Bato on a penitentiary pilgrimage to visit and pray to the Lady of Sorrows. Catandungan Festival is an annual celebration of the island province. It is the anniversary celebration and tribute to its founders, to commemorate the provinces' independence from Albay. The main features of the festival are Street Dancing – Pantomina Dance, Beauty Pageant, Agro-Trade Fair, Sports Fest, Guided Tour, Surfing Cup, and Art/Photo Exhibits. It occurs every October 24–26. Abaka Festival is an annual cultural celebration of the province to recognize the importance of abaca in the local economy and to showcase its versatility as a major source of livelihood. Highlights of the festival are Padadyaw Ginamlangan or Padadyaw kan Abaka, Pinukpok Fashion Show, Urag Catandungan sports competitions, Kantang Catandungan or Musika kan Isla, Festival Dance Competition, Binibini and Ginoong Bikol, Hagyan sa Kabitoonan and Jobs Fair. It occurs every 4th week of May. 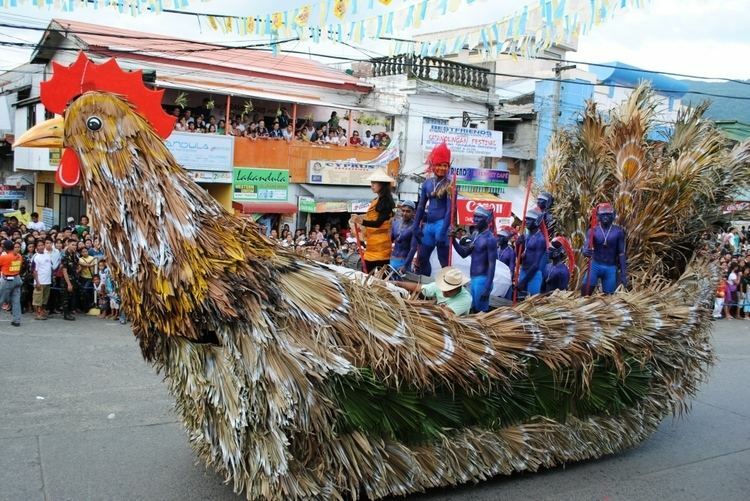 Dinahit Festival is a prime festival in the municipality of Pandan celebrated every April. The word Dinahit is a native sailing vessel used by the Austronesians to travel across the ocean to reach Pandan, the northernmost municipality of the province. Festival activities include street dancing, beauty pageant, trade fair, and different contests such as carabao race and boat race. Kalbaryo or Calvary, commonly staged during Holy Week, is a reenactment of the passion of Christ's way of the cross annually celebrated in the Municipality of San Andres during Holy Wednesday and Good Friday. Kagharong is a native depiction of The Nativity scene held annually during Christmas season. Pantomina is a native dance, popular on occasions of importance and mostly practiced in rural areas. It is a dance interpretation (pantomime) of a rooster courting a hen. Padadyao sa Tinampo is native cultural presentation of street dancing held every October 24 to commemorate the province's founding anniversary. Sugbo Festival is celebrated by the seven barangays of Hitoma in Caramoran that produces sugbo or tiger grass, a bamboo-like perennial grass used to make brooms. Celebrated every month of May coinciding with the Hitoma barangay fiesta, it is being institutionalized with the support of the provincial government, LGU of Caramoran and national line agencies to promote the commercial development of the local lasa or tiger grass industry and to create signature products from tiger grass. Fishermen from Catanduanes have always been linked to Benham Rise. Catandunganon people have been calling it Kalipung-awan (loneliness in an isolated place). Benham Rise is an integral part of Catandunganon culture. Rich marine resources are given by this marine biodiverse zone to Catandunganons. In fact, Catandunganons have long been celebrating this place even in their ancient folksongs, stories and poetry. Virac, the capital town, is the educational center in the province, hosting a number of schools specializing in various degrees. The most notable include the Catanduanes State University (CSU) with a campus in the northern town of Panganiban. It was established on June 19, 1971, through Republic Act 6341, authored by Catanduanes Congressman Jose M. Alberto, which converted the Virac National Agricultural and Trade School into the Catanduanes State College. The college was elevated to university status in October 2012. Other notable schools include the Catanduanes Colleges (CC), Catanduanes Institute of Technology Foundation (CITFI), and Christian Polytechnic Institute of Catanduanes (CPIC). The Philippine National Police in the province is composed of the local police force and the fire brigade's services. The province crime rate is 6.39 in 2006. Crime volume over the same period was 191. Local cable companies operate in most towns. TV repeaters allow access to Manila broadcast stations. Satellite dish is a common site in rooftops of houses in remote areas. Electrical Power is supplied by power plants, a mix of diesel powered generators and hydroelectric turbines. Electricity is served on 24-hour basis to all the eleven (11) municipalities. Catanduanes has a 220-volt electrical system. Virac Airport is the primary airport serving Catanduanes with scheduled flights to Manila. From the seaport of Tabaco, MV Calixta 2, 4 and 5 travels to the port of San Andres. MV Eugene Elson and fast-craft service MV Silangan can travel in just one hour and a half which docks in the port of Virac. Overland, a 12-hour bus ride from Manila to Tabaco, in Albay, is needed to cover the 580 km (360 mi) distance. Several ferry services in the Port of Tabaco offer connections to San Andres, which takes about 2½ hours, or to Virac Seaport, at 3½ hours, or at least 1½ hours for fast-craft service. Numerous bus lines operate air-conditioned and ordinary buses and coaches travel from Manila to Tabaco in Albay. Some of these buses are loaded to the Ferry for its final stop in the town of Virac. Transportation around the Island is provided by jeepneys, vans and bus for inter-town travel, while tricycles and pedicabs will take you around the towns. Private vehicles are also available for hire, which can take you to any point of the Island. The island is a biodiversity hotspot. Its rainforests are home to the Philippine brown deer, flying foxes, and other endemic bat species, warty pigs, civets, cobras, giant pythons, monitor lizards, sailfin lizards and other endemic animals. Exotic bird species such as the Philippine hornbill, rail, parrot, bittern, egret, pheasant, coot, lapwing, plover, Philippine duck, quail, owl, oriole, kingfisher, swiftlets and many more are also found. A record of "Philippines Birding Trip Reports" has found out massive bird species in several portion of the island such as the watershed and timberland forests reserve in Gigmoto where scattered deer populations are also usually reported. The Catanduanes bleeding-heart (Gallicolumba luzonica rubiventris) had experienced over-exploitation in the late 20th century. Although most forests are still intact, this species has suffered over-hunting, making it very rare and is believed to be near extinction or already extinct as its last reported specimen was collected in 1971. The southern giant slender-tailed cloud rat (budkon/bugkon) which is found only in Catanduanes and the southern half of Luzon Island, is still widely reported. It is critically endangered as humans hunt them for food and for some extent, as pets. In mainland Luzon, sightings of the creature are already rare while in Marinduque, it is generally considered extinct. Inventory of the entomological fauna in the island has been conducted by various scientific institutions. A survey which was submitted in the national museum has revealed interesting species in the forest reserve of Gigmoto and Pandan. A total of 2,000 entomological specimens and its allies were collected compromising 323 species under 45 genera and 50 families. The Catanduanes narrow-mouthed frog (Kaloula kokacii), an arboreal amphibian found only in Catanduanes and some parts of Bicol, enjoys its diversity but is being carefully monitored. Another endemic amphibian Hylarana similis is found only in Catanduanes and Luzon islands. The published research by Brown and Siler in Journal of Biogeography (2013) actually reported this species in the forests of Gigmoto. One of the very recent species found in Catanduanes and portions of Bicol region is the new loam-swimming skink, a legless reptile with its assigned scientific name Brachymeles makusog. The dipterocarp forest also harbor numerous tropical plant species including the threatened species of pitcher plants and rafflesia as well as endemic banana varieties. Many highly economical hardwood trees such as yakal, apitong, palosapis, and molave are still found in the central forests though local reports indicate that these species are already threatened. Mangrove forests exist in several coastal areas but the largest locations are in Banquerohan (Viga-Panganiban), Agoho in San Andres and Batalay in Bato. Catanduanes reefs harbor many endangered and threatened types of mollusks such as giant Triton, cowries, abalone, cone snails, conches, octopuses, squids, and nautiluses. Marine mammals are also reported to frequent on its eastern coasts such as species of dolphins and whales which appear from March to June. Many edible marine algae such as caulerpa, valonia, and turbellaria also grow abundantly on its rough coasts. The island is nestled in the very beginning of the Kuroshio Current, a sea current that runs through the eastern Philippines, Taiwan, and Japan. Tuna migration, which is at its peak in the months of April and May, can be seen in the Maqueda channel. Dugongs were once known to swim on Catanduanes coasts, but this event is already becoming extremely rare. Catanduanes coast is one of the best spots for flying fish population; a flying fish can attain its fullest size in Catanduanes which may weigh 300 grams (11 oz). Rabbitfish Siganus sp., a kind of reef fish is one of the most heavily exploited marine tropical fish in Catanduanes. Its fry that comes out in shallow coasts during the breeding season (March–May) are fished in large volumes. Approximately 10 million rabbitfish fries are caught annually. That natural event supplies food for many people but its ecological impact can be devastating. Nature advocates started to strengthen their campaign for an eco-dialogue for this matter. Sea cucumbers are also abundant in many islets of the eastern coasts facing the Philippine Sea. Palumbanes (province satellite group of islands) has beaches with fine yellowish-white sand. It is also one of the most biodiverse marine zones of the island. However, coral reef exploitation has severely inflicted for the last 10 years on its waters. The local government and some sectors are already undergoing efforts to revive Palumbanes Island through building artificial reefs and employing fishing regulations.